ArubaSalsa's 10th year Dance-A-Thon charity event! Join ArubaSalsa's Dance-A-Thon Charity for Casa Cuna event! 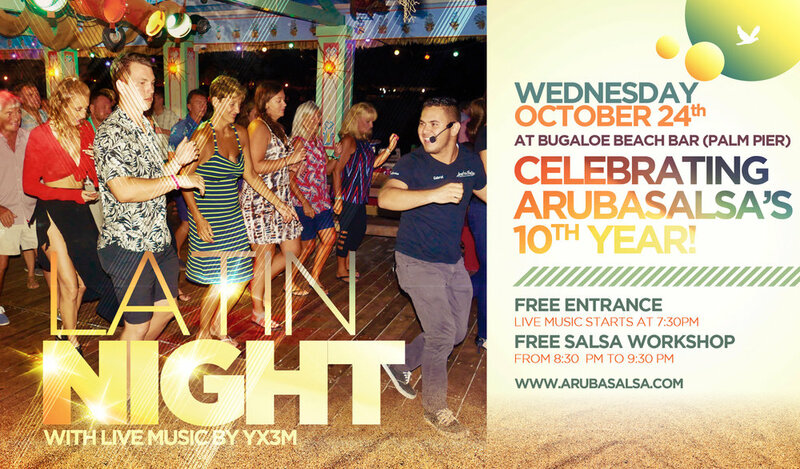 ArubaSalsa is celebrating it's 10th year of existence and we're having 5 days of events from oct. 24th to 28th. We don't just party however, we also love to give back to the community of Aruba. From free classes at Imeldahof, to participating every year in the reef care project, to helping out during ArubaDoet, we love giving back in any way we can. That's why we now are helping out Casa Cuna with our Dance-A-Thon charity event! Sign up with a dance partner and get ready to dance. We want to know who can dance the longest throughout the night. There's going to be 3 genres of music. Salsa, Bachata and Merengue. The goal is to dance non stop. the last couple standing is the winner. Registration is required, and it's only Afl.15 per person. Please register at www.ArubaSalsa.com or by sending a whatsapp to 593-7506. ArubaSalsa is ready for it's 10th year celebration! ArubaSalsa is ready to celebrate it's 10th year of existence! 1 day isn't enough... so we have 5 days of celebration planned, and it's going to be amazing! Block the 24th till the 28th of October in your calendars and get ready to have fun, and party! ArubaSalsa announces a new course... Dancing Bellies, lessons for mommies-to-be! We are super excited to announce a new course dedicated to mommies-to-be… Dancing Bellies! Starting on Tuesday, October 9th at 6:30 pm, expecting mommies-to-be can now enjoy dancing lessons tailored especially for them! These classes are given by the co-owner of ArubaSalsa Melitza, who is also expecting! Expect great lessons that vary completely per class. With specialized stretching for pregnant ladies and beautiful dancing moves from different dancing styles like Salsa, Bachata, Merengue and more! Dancing has lots of benefits for expecting ladies, improving how they feel, staying fit, helping out with a better delivery, but also great for a quicker recovery post-partum! The lessons are given 2 times a week, on Tuesdays and Fridays at 6:30pm at Emotions. Drop in classes are Afl.25 per person, or Afl.150 per person for 8 classes. Go to www.ArubaSalsa.com/join-us or call or whatsapp 593-7506. 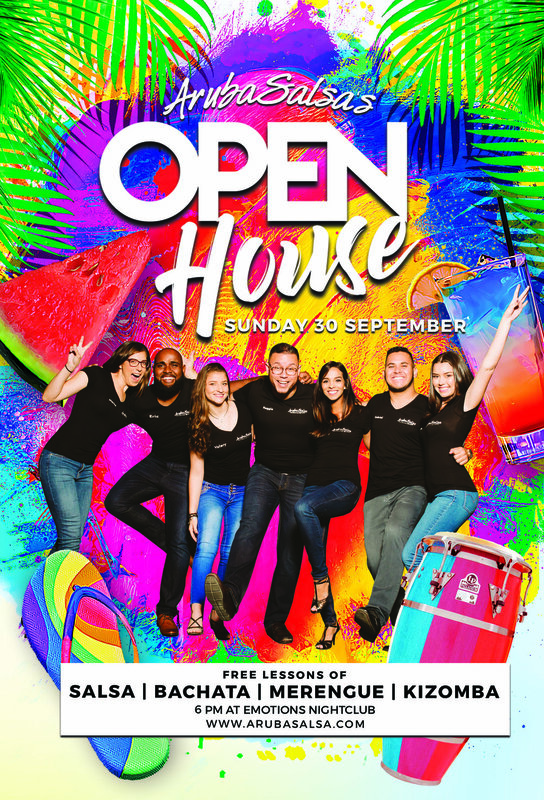 ArubaSalsa's next Popular Open House is on Sunday, Sept. 30th! ArubaSalsa's start of a new season is around the corner... This means that we are organizing our Popular Open House for you! Join us on Sunday, September 30th, 6 pm at Emotions Nightclub for FREE Salsa, Bachata, Merengue and Kizomba lessons! - Delicious snacks by G&G Pizza and Wings! Sign up at www.ArubaSalsa.com/join-us or call or send a whatsapp to 593-7506 today! ArubaSalsa: Fun Lessons, Great Dancing, Awesome Friends!